Did you know this project now has its own website – with heaps of additional information. Note: If you would like to link to, feature or re-publish this project – please see here. Below you will find the tutorial showing how to make the cards. On the website you can also find a complete supply list and all the information on purchasing a template to create the labels. Find some playing cards! 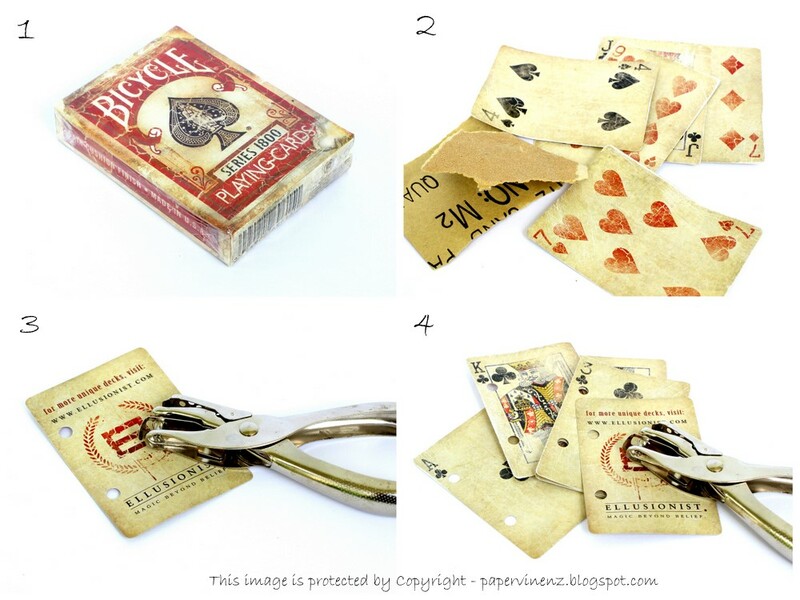 These fabulous cards from Ellusionist shown here are great as they have a pre-aged Vintage look. Create your reasons labels to attach to the cards – detailed information below. Use another Joker card to create the front cover. Using double sided tape and/or glue – attach the inserts to the cards. Using glue will take longer to dry and will stiffen the cards up adding more dimension. NOTE: I have created a FAQ page here with additional information on products used and where to buy them or you can check out the dedicated website here. There are two templates available for purchase. This page HERE has all the information you need to make a decision regarding which is best for you. $6.99 – download a PowerPoint presentation with placeholder text. Print ready. You can see exactly what is included in the templates on this page here. Please read what you will receive and what you will need to do after purchasing to re-create the reasons as shown. If you do not want to purchase the template – no problem! You can create your own cards. To help you out – here are the dimensions for the boxes I have used. Inner cream box – 5.3cm x 3.3cmIf you want to use the same font it is called Trinigan FG and you can download it for FREE from fontspace.com. Thank you so much for the tutorial:) I am so going to do this:)This is such a sweet gift. Ooooh! I am SO excited to try this for Valentine's Day! Thanks for the tutorial! great, detailed tutorial! Only question I'm left with…how long did it take you to come up with all 52 reasons?! Just a couple of hours and a couple of glasses of wine! Wow. This is awesome.. I love the tutorial.. If I can come up with 52 reasons fast, I am going to make these cards.. 😀 HaHa! Those are too cool. What a great idea. What a great idea! Adorable! You say you do the reasons on powerpoint but you also use the snorkel paper, are you printing what you make onto the snorkel paper??? Hi there – as stated above I am using Digital versions of the Snorkel Paper Collection to create the 6x4cm boxes (18 per page)and printing onto photo paper. I love your blog, and I wanted to let you know about this new blog I just started called http://www.linkycandy.com It's one big linky party with tons of options and categories to link up your blog and as many posts as you want! I just launched it last night, and would love for you to be apart of it! Thank you so much! If there is anything I could help you with anytime just let me know! Oh yeah… There is a really cool feature on it too! Each week there will be a featured blogger for each category! The blog with the most clicks gets featured! And each linky party will start over at the beginning of each month, so everyone can get a chance to be the first to link up. Thank you so much! I love the post. You have pretty idea with these cards. Amazing work. This is fantastic! This is going to be the perfect gift for my bf for Valentine's day this year, comes from my heart, homemade and won't cost me much at all, but time! Thanks again…….. I must say….I have never received soooooo many repin notifications as with your project….it's amazing. And from all over the world in so many different languages….it just goes to show that love has no one language….it's a language of it's own!!! Thanks so much for sharing your project….allowing me to pin it and giving me the opportunity to "meet" so many others that love the things I love on Pinterest!!! Great project!! I am thrilled to hear that Jenilea – I have certainly had a lot of hits from Pinterest and I love to know that other people like my projects too! Thanks for that handy hint Chris! Chris, How did you change the pre-made template colors? When I pull it up they are green bottle labels that I'd like to change to red. How did you do that? I found these worked great – but we printed them @ 75% size to fit inside the little box on the cards- the kids preferred this look! Thanks so much for the tips!!! Are you positive your red square was 6cm x 3cm? Converted to inches, it's 2.4 x 1.2 and when I create that square in PowerPoint, it's long and skinny. Just wondering because I ordered the playing cards on-line and watch to get the reasons set up and printed so that when the cards arrive, I can assemble before my husband leaves for Germany. He'll be gone over the holiday, which is why I want to surprise him by hiding this in his suitcase. 🙂 Thanks! Stephanie – thanks for pointing out that typo. It should have been 6x4cm – I have corrected it in the post above. How do you finish the cards once you glue your reason you love them onto the playing card? Like do you laminate them or what? Love your idea, I'm trying to for this valentine's day. I think this is something just about anyone would enjoy getting from his/her significant other. First of all, I LOVE this project! I just ordered a deck of cards from Amazon and can't wait to get started on making this for my boyfriend 🙂 But I'm having trouble with the font you shared. I was able to download it, but when I try to install it, my computer says the file is broken. Anyone know how I can fix this problem, or know where I can get this font or something similar? Thanks! Hi – It's a common font so I would just google and get another source. I have not heard of anyone else having problems but I will try and check it later on. FYI – I have just tested this font by downloading from the same place and installing on another computer. It worked no problem! I got it to work on a different computer as well. Not sure why my other computer won't install it. Thanks for checking!! wonderful idea , I so want to do this for my husband, sure do wish you would share about 30 or more of your reasons!! Wonderful idea! Can't wait to make. To address the reasons, if you google ways to say, OR reasons to say, I love you, you will find more than you can ever use!!! HI! I am in the process of making these beautiful cards and was just wondering what were the dimensions of the inner cream colored boxes you made on powerpoint?? I love the vintage looking cards you used! That's for the fab tutorial! I will give it a try-if I'm not lucky to win! I follow you on RSS as well! I love that you shared a tutorial for this book. This is the coolest thing EVER!!!! I already made my list of 52 reasons–it was actaully quite therapeutic for me, and I know my husband is going to feel so special when he gets this gift. Thank you so much for sharing it with us! I just finished making mine! My boyfriend is going to LOVE it! He's trying to guess what i made but there's no way he will guess this! This is such an awesome idea! I'm going to have to try it. Thank you so much for posting this tutorial. I will be spending some time coming up with my reasons. I may have to whittle the long list down. But husband will love it. Thank you SO much for the step by step! I will actually try it now! (if I dont win that is!) 🙂 I always get so intimidated trying to copy these cute ideas but you made it seem so easy. This is such a cute idea! I'm totally going to try it out! I am a new follower and found your "52 Reasons I Love You" on Pinterest. Such a cute idea! There are a lot of great ideas on here – thank you for sharing! Thank you for the opportunity to win this giveaway! I need this for my Valentine! Love it! Thanks for the tutorial and tips! I would really love to win the 52 Reasons I love you!! I love love love love this idea!!! It is awesome!!! You are so creative! I aspire to be this creative! I am also entering to win this! 🙂 I submitted a request to follow you via email 🙂 Love your ideas!! Love this sweet idea!! Just started following you and hoping to win the "52 reasons cards!" Thank you for your generosity. I followed you over here from Pinterest. Adorei a ideia do segundo vencedor, paranéns!! Thanks for the awesome tutorial! I used Avery brand 2×2 square labels and used one of the many free templates available on the Avery website and it turned out amazing, it was super easy for me to think of 52 reasons, I actually had MORE reasons than cards. Okay, so I don't have a significant other, but I'm going to do this for my 17-year-old daughter for Valentine's (which is her favorite holiday) 🙂 She will love this, and I will love doing it for her!! Thanks for a fabulous idea!! I love love love this project!! Just one quick question…on this tutorial you wrote that you created rectangles that are 6x4cm, but on your original blog post, you said 6x3cm…. The correct measurement is 6x4cm and I will double check to make sure I have that right everywhere! I see this album on Carmen's Blog (Beyond the Fringe Crafts) and I love it…. Wow! you have a lot of ideas here but this one I will going to do. I have a lot of playing cards packages and thinking some ideas to used for my crafts.. So now I have one more idea. Oh, what a neat and clever idea. This is such a neat idea! Going to do it for my husband of 41 years for Valentines day. Thanks so much for the inspiration. NOTE – I am not saying any of these will definitely work – but they might be your best bet for trying! I would try on the spare cards in the pack first and make sure you can write on them afterwards before you try and do them all. I put them in a single layer in a toaster oven for about 3-5 minutes. It worked great – just watch it carefully so you don't burn the house down! Then I scuffed them up with a fine sand paper. I had a brand new deck from the mega pack at costco. I'm excited to finish this! I am working on it now. Just wanted to tell people to start writing/typing your 52 reasons. They'll come to you. For inspiration re-read love notes and cards, and look at photographs. This is a wonderful project. I will pin it, if it's OK for you. LOVE THIS! Such a great idea. I just wanted to let you know that I have featured this as one of the craft projects on my website. It will post 02/06/12. This is just so awesome. I saw it on Pintrest, and immediately repined it. I can't wait to try it for myself. Thank you so very much!! gorgeous idea and wonderful gift! i cant wait to see the finished result in person! If you have inserted the jpeg as a picture into a PowerPoint – just go to Format_Picture Shape and change to a rounded rectangle. If you have inserted a shape and filled it with the jpeg – just go to Format_Edit Shape and do the same thing. Powerpoint Help function is great as well. I love this project, Lowri! You're fabulous! how do i chang the shape of the image to a rounded rectangle in power point? The papers need to be unzipped after you download them and then they are .jpg picture files. Hey there…I love this idea and included it in a post that I wrote about valentine's for grandparents. I included your link so hopefully people will stop by to read your tutorial. Thanks for sharing your creativity! Thank you for the idea!! I am trying to get 18 cards per page in Power Point on a sheet of photo paper. I am only able to get 9 and they are really small. Any suggestions?? As stated above – you need to create one box and then copy and paste 18 boxes per slide – not print 18 slides per page. This is such a creative idea, thanks for sharing! Question – how do you make the colored paper a 6X4cm size in powerpoint for the red and the 5.3X3.3cm size for the cream? Hi – I think this is the part you need! "In PowerPoint I inserted one of the jpegs from the downloaded digital paper collection onto a slide and then cropped it to 6x4cm. I repeated this for the inside rectangle which is 5.3×3.3cm using the cream digital paper, changed the shape of the image to a rounded rectangle and then just typed a text box on top." To find the “Crop” feature, click on your picture in Powerpoint then go to Format on the very top right of the menu. What a neat project! How fun to give to one of your kids too! They could leave it out and flip to a different reason whenever they need a pick-me-up. Pinning this! What a great idea! I have been trying to work on this myself … it's work! I also wanna say CONGRATS on your post making – MSN V-day Gift Ideas – News! CONGRATULATIONS!!! This is a gorgeous idea! Love it! Nice tutorial. I saw this project floating around Craftster for the past 5 years or so and have wanted to make one ever since then! Sorry I am unable to provide a template. All of the information you need should be in this post. If you have any specific additional questions, feel free to email me. Would it be corny if I did this for my Girlfriend? I see alot of girls are doing it for their Boyfriends/Husbands….Would it still do the job or would it just be wierd? I hope your right. I just got news that shes going to Africa to help sick kids through her school. Its only for 10 days but with no communication at all, i want to keep her happy and motivated. I think this is a good fit and will start working on it but can u recommend anything else? Absolutely fantastic idea. I can't find the words to explain how amazed i am to see your paper vine. Thanks because shearing this post with us. 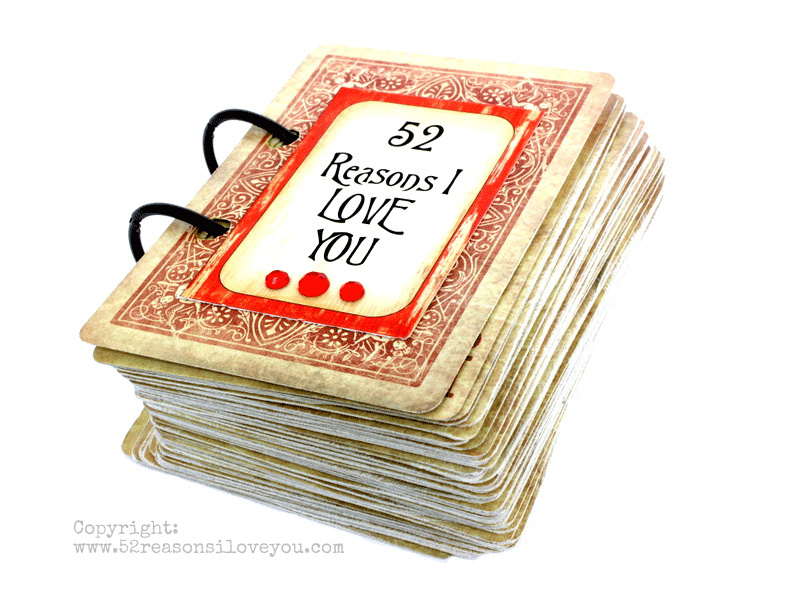 I so love the 52 reasons idea – saw it on Dating Divas for anniversary ideas today and might just be doing it for the hubby this year! Thanks for such a clear tutorial! So cute!! We would love for you to come share it at our weekly link party and enter to win a $50 gift card to Mikarose Clothing! Anyone have recommendations for other fonts you have used? I don't want to buy a new font, but just to use one I already have in power point. Any suggestions would be appreciated! Hi Lindsay – the font is actually free and just takes a couple of seconds to download and install. If you are trying one from your computer you will just have to play around a little to get the sizing right. I would pick one to match the style of the cards you are making. That is such a thoughtful and sweet idea! !And it dosent cost an arm and a leg!! Just right up my street!! Hi Lowri, I emailed you eariler today… Just making sure it didn't slip into your spam folder 😀 Thanks for all your help! Hi! I made this one yesterday and it was beutiful! Thank you very much for the idea! I didn't find vintage style cards, so I used the typical cards and with a lighter I made them a bit grey in order to look like used. Thanks again! Your blog is awesome! I made this and it turned out wonderfully! Thanks for the idea!! I know what I am making some people for Christmas! =) You know, you could also put Bible verses on here to encourage the recipient. I think I will do some o both. Thank you so much for this tutorial! Now to go to the Dollar store and get some packs of cards. I can't find black album rings anywhere!! Where did you find yours? 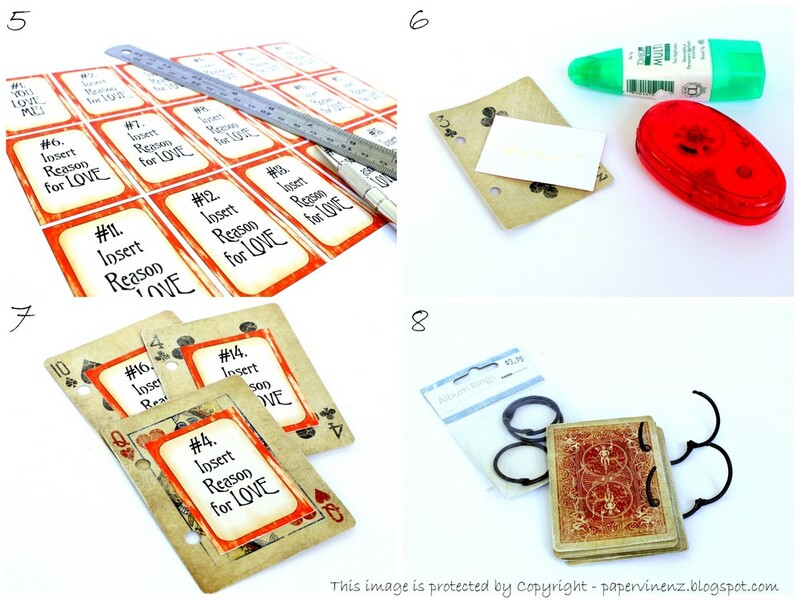 i loved this idea… and i really what to make it myself.. so i have a question.. do you use paper cards or plastic ones?